Acetaminophen is an organic compound that inhibits synthesis of prostagladins in the central nervous system, thus raising the body's pain threshold, and further impacts the temperature-regulating center of the brain, thus reducing fever. Its exact mechanism is still poorly understood. Unlike other common analgesics, such as aspirin and ibuprofen, acetaminophen has no anti-inflammatory properties, and so it is not a member of the class of drugs known as non-steroidal anti-inflammatory drugs or NSAIDs. In normal doses, acetaminophen is less likely than NSAIDs to irritate the lining of the stomach and cause peptic ulcers, and does not affect blood coagulation, the kidneys, or the fetal ductus arteriosus (as NSAIDS can). It is a possible alternative for people allergic to NSAIDs or who are using anticoagulants. Of course, use of a pain-killing drug like acetaminophen is just one of a multitude of approaches to dealing with pain, which has varied causes and influences. Among non-drug treatments and preventative actions are acupuncture, homeopathy, naturopathy, chiropractic, dietary changes, and ayurveda. Given the power of the mind, there are also various mind-body therapies, such as hypnosis, biofeedback, meditation, and visualization. Certainly the key to dealing with pain is understanding the cause, as well as trying to prevent the pain before it occurs, or recognizing the symptoms and addressing the problem early. Like NSAIDs and unlike opioid analgesics, acetaminophen does not cause euphoria or alter mood. Acetaminophen and NSAIDs have the benefit of being free of problems with physiological addiction, chemical dependency, physiological tolerance, and withdrawal. The words paracetamol and acetaminophen both come from the chemical names for the compound: N-acetyl-para-aminophenol and para-acetyl-amino-phenol. In ancient and medieval times, the only antipyretic agents known were compounds contained in willow bark (a family of chemicals known as salicins, which led to the development of aspirin), and compounds contained in cinchona bark. Cinchona bark was also used to create the anti-malaria drug quinine. Quinine itself also has antipyretic effects. Efforts to refine and isolate salicin and salicylic acid took place throughout the middle and late nineteenth century. When the cinchona tree became scarce in the 1880s, people began to look for alternatives. Two antipyretic agents were developed in the 1880s: acetanilide in 1886 and phenacetin in 1887. By this time, acetaminophen had already been synthesized by Harmon Northrop Morse via the reduction of p-nitrophenol with tin in glacial acetic acid. While this was first performed in 1873, acetaminophen was not used medically for another two decades. In 1893, acetaminophen was discovered in the urine of individuals who had taken phenacetin, and was concentrated into a white, crystalline compound with a bitter taste. In 1899, acetaminophen was found to be a metabolite of acetanilide. This discovery was largely ignored at the time. In 1946, the Institute for the Study of Analgesic and Sedative Drugs awarded a grant to the New York City Department of Health to study the problems associated with analgesic agents. Bernard Brodie and Julius Axelrod were assigned to investigate why non-aspirin agents were associated with the development of methemoglobinemia, a non-lethal blood condition. In 1948, Brodie and Axelrod linked the use of acetanilide with methemoglobinemia and determined that the analgesic effect of acetanilide was due to its active metabolite acetaminophen. They advocated the use of acetaminophen (paracetamol), since it did not have the toxic effects of acetanilide (Brodie and Axelrod 1948). The product went on sale in the United States in 1955 under the brand name "Tylenol." In 1956, 500 mg tablets of acetaminophen went on sale in the United Kingdom under the trade name "Panadol®," produced by Frederick Stearns & Co., a subsidiary of Sterling Drug Inc. Panadol® was originally available only by prescription, for the relief of pain and fever, and was advertised as being "gentle to the stomach," since other analgesic agents of the time contained aspirin, a known stomach irritant. In June 1958, a children's formulation, "Panadol Elixir®," was released. In 1963, acetaminophen was added to the British Pharmacopoeia, and has gained popularity since then as an analgesic agent with few side effects and little interaction with other pharmaceutical agents. The U.S. patent on acetaminophen has expired and generic versions of the drug are widely available under the Drug Price Competition and Patent Term Restoration Act of 1984, although certain Tylenol preparations are protected until 2007. U.S. patent 6,126,967 filed September 3, 1998, was granted for "Extended release acetaminophen particles." 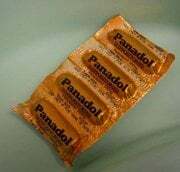 "Panadol," which is marketed in Europe, Asia, Australia, and Oceania, is a widely available brand, sold in over 80 countries. In North America, acetaminophen is sold in generic form or under a number of trade names: for instance "Tylenol" (McNeil-PPC, Inc.), "Anacin-3," and "Datril." In some formulations acetaminophen is combined with the opioid codeine, sometimes referred to as "co-codamol" (BAN). In the United States, this is marketed under the name of "Tylenol 1," "Tylenol 2," "Tylenol 3," and "Tylenol 4," and is only available by prescription. In the UK and in many other countries, this combination is marketed under the names of "Tylex CD" and "Panadeine." Other names include "Captin," "Disprol," "Dymadon," "Fensum," "Hedex," "Mexalen," "Nofedol," "Pediapirin," and "Perfalgan." Acetaminophen is also combined with oxycodone and marketed in the U.S. as "Percocet." It is commonly administered in tablet, liquid suspension, or suppository form. The common adult dose is 500 mg to 1000 mg four times a day. The recommended maximum daily dose, for adults, is 4 grams. Doses above 150 mg/kg, or 7.5 g for an adult, are likely to cause hepatotoxicity (liver damage). In recommended doses, acetaminophen is considered safe for children and infants as well as for adults. Because of the widespread availability of acetaminophen, its effectiveness is often underestimated. Acetaminophen has long been suspected of having a similar mechanism of action to aspirin because of the similarity in structure. That is, it has been assumed that acetaminophen acts by reducing production of prostaglandins, which are involved in the pain and fever processes, by inhibiting the cyclooxygenase (COX) enzyme. However, there are important differences between the effects of aspirin and acetaminophen. Prostaglandins participate in the inflammatory response, but acetaminophen has no appreciable anti-inflammatory action. Furthermore, COX also produces thromboxanes which aid in blood clotting—aspirin reduces blood clotting, but acetaminophen does not. Finally, aspirin and the other NSAIDs commonly have detrimental effects on the stomach lining, where prostaglandins serve a protective role, but acetaminophen is safe. Indeed, while aspirin acts as an irreversible inhibitor of COX and directly blocks the enzyme's active site, Boutaud et al. (2002) found that acetaminophen indirectly blocks COX, and that this blockade is ineffective in the presence of peroxides. This might explain why acetaminophen is effective in the central nervous system and in endothelial cells but not in platelets and immune cells which have high levels of peroxides. Swierkosz et al. (2002) reported data suggesting that acetaminophen selectively blocks a variant of the COX enzyme that is different from the then-known variants COX-1 and COX-2. This enzyme is now referred to as COX-3. Its exact mechanism of action is still poorly understood, but future research may provide further insight into how it works. Acetaminophen is metabolized primarily in the liver, where most of it is converted to inactive compounds by conjugation with sulfate and glucuronide, and then excreted by the kidneys. Only a small portion is metabolized via the hepatic cytochrome P450 enzyme system. The toxic effects of acetaminophen are due to a minor alkylating metabolite (N-acetyl-p-benzo-quinone imine), not acetaminophen itself or any of the major metabolites. This toxic metabolite reacts with sulfhydryl groups. At usual doses, it is quickly detoxified by combining irreversibly with the sulfhydryl group of glutathione to produce a non-toxic conjugate that is eventually excreted by the kidneys. Because the causes and impact of pain are diverse, treatments vary, both for acute and chronic pain. Use of a pain-killing drug like acetaminophen is just one approach, which may be used alone or in cooperation with other treatments. "Alternative medicine" is a broad category that includes treatments (and preventive actions) generally considered outside of conventional Western medicine, such as acupuncture, homeopathy, naturopathy, and chiropractic. Ayurveda is a medical approach rooted in Vedic culture. "Complimentary medicine" includes those treatments or therapy done together with conventional medicine, such as using acupuncture to reduce pain during surgery instead of anesthetics. "Holistic medicine" (mind and body) strives to treat the whole person, attending to the mental, emotional, and spiritual aspects, in addition to the physical body or the organs where the symptoms occur. It includes treatments such as hypnosis, meditation, relaxation techniques, and visualization. Those treatments that relay on the body's own healing powers may be lumped into the category of "Natural Medicine," and include herbal remedies and diet and water therapies. The mind can be a powerful tool, if not the most powerful tool, in dealing with pain. Some individuals learn to even undergo surgery without any anesthesia. Furthermore, sometimes pain may be attributed to mind/body disunity, such as headaches arising when a person is engaged in one activity, but focused and worrying about something entirely different or remote. Thus, it is important to consider internal aspects of being human in addressing pain. Understanding the cause of pain is fundamental to dealing with the problem. Pain is a signpost of a disharmony in the body. Use of pain-killing drugs to mask the symptoms without addressing the cause can lead to chronic conditions. Also key is taking preventative measures before pain occurs, or early recognition of the symptoms and forestalling the problem. Acetaminophen has a narrow therapeutic index. This means that the common dose is close to the overdose, making it a relatively dangerous substance. Acetaminophen single doses above 10 grams or chronic doses over 5 grams per day in a well-nourished non-consumer of alcohol, or above 4 grams per day in a poorly nourished consumer of alcohol, can cause significant injury to the liver. Without timely treatment, acetaminophen overdoses can lead to liver failure and death within days. Because of the wide over-the-counter availability of the drug, it is sometimes used in suicide attempts. Acetaminophen should not be taken after alcohol consumption, because the liver, when engaged in alcohol breakdown, cannot properly dispose of acetaminophen, thus increasing the risk of hepatotoxicity. When used responsibly, acetaminophen is one of the safest medications available for analgesia. The drug lacks effects on the cyclooxygenase system so it does not cause injury to the esophagus, stomach, small intestine, or large intestine, in contrast to NSAIDs. Additionally, patients with kidney disease are able to take acetaminophen, whereas NSAIDs can cause acute renal failure in certain patients. Acetaminophen also lacks problems with drug interactions. The analgesic potency is equivalent in non-inflammatory conditions to NSAIDs as long as the dose of paracetamol is adequate. One gram of acetaminophen three times a day is equivalent to analgesia provided by NSAIDs in osteoarthritis, for example. When co-administered with amitriptyline, 50 mg twice a day, the combination is as effective as acetaminophen with codeine, but does not lose effectiveness as an analgesic over time as does chronic administration of narcotics. Unlike aspirin, acetaminophen does not contribute to the risk of Reye's syndrome in children with viral illnesses. These factors have made acetaminophen the analgesic of choice for mild and moderate pain for patients in hospitals and make it the leading analgesic for outpatient use. Acetaminophen is extremely toxic to cats and should not be given to them under any circumstances. Any cases of suspected ingestion should be taken to a veterinarian immediately for decontamination. As mentioned above, acetaminophen is mostly converted to inactive compounds by conjugation with sulfate and glucuronide, with a small portion being metabolized via the cytochrome P450 enzyme system. The cytochrome P450 system oxidizes acetaminophen to produce a highly reactive intermediary metabolite, N-acetyl-p-benzo-quinone imine (NAPQI). Under normal conditions, NAPQI is detoxified by conjugation with glutathione. In cases of acetaminophen toxicity, the sulfate and glucuronide pathways become saturated, and more acetaminophen is shunted to the cytochrome P450 system to produce NAPQI. Subsequently, hepatocellular supplies of glutathione become exhausted and NAPQI is free to react with cellular membrane molecules, resulting in widespread hepatocyte damage and death, clinically leading to acute hepatic necrosis. In animal studies, 70 percent of hepatic glutathione must be depleted before hepatotoxicity occurs. The toxic dose of acetaminophen is highly variable. In adults, single doses above 10 grams or 140 mg/kg have a reasonable likelihood of causing toxicity. In adults, single doses of more than 25 grams have a high risk of lethality. Toxicity can also occur when multiple smaller doses within 24 hours exceed these levels, or even with chronic ingestion of smaller doses. However, unintentional paracetamol overdose in children rarely causes illness or death. This may be due in part to the immature cytochrome P450 (CYP) enzyme system in children. Excessive consumption of alcohol can impair liver function and increase the potential toxicity of acetaminophen. For this reason, other analgesics such as aspirin or ibuprofen are recommended for hangovers. Some individuals are more susceptible to hepatotoxicity, with toxic doses as low as 4 g/day, and death with as little as 6 g/day. Fasting is a risk factor, possibly because of depletion of hepatic glutathione reserves. It is well documented that concomitant use of the CYP2E1 inducer isoniazid increases the risk of hepatotoxicity, though whether CYP2E1 induction is related to the hepatotoxicity in this case is unclear (Crippin 1993; Nolan et al. 1994). Chronic alcoholism, which also induces CYP2E1, is also well known to increase the risk of acetaminophen-induced hepatotoxicity (Zimmerman & Maddrey 1995). Concomitant use of other drugs that induce CYP enzymes such as antiepileptics (including carbamazepine, phenytoin, barbiturates, etc.) have also been reported as risk factors. Individuals who have overdosed on acetaminophen generally have no specific symptoms for the first 24 hours. Although anorexia, nausea, vomiting, and diaphoresis are common initially, these symptoms resolve after several hours. After resolution of these non-specific symptoms, individuals tend to feel better, and may believe that the worst is over. If a toxic dose was absorbed, after this brief feeling of relative wellness, the individual develops overt hepatic failure. In massive overdoses, coma and metabolic acidosis may occur prior to hepatic failure. Damage generally occurs in hepatocytes as they metabolize the acetaminophen. However, acute renal failure also may occur. This is usually caused by either hepatorenal syndrome or multi-system organ failure. Acute renal failure may also be the primary clinical manifestation of toxicity. In these cases, it is possible that the toxic metabolite is produced more in the kidneys than in the liver. The prognosis of acetaminophen varies depending on the dose and the appropriate treatment. In some cases, massive hepatic necrosis leads to fulminant hepatic failure with complications of bleeding, hypoglycemia, renal failure, hepatic encephalopathy, cerebral edema, sepsis, multiple organ failure, and death within days. In many cases, the hepatic necrosis may run its course, hepatic function may return, and the patient may survive with liver function returning to normal in a few weeks. Evidence of liver toxicity may develop in one to four days, although in severe cases it may be evident in 12 hours. Right upper quadrant tenderness may be present. Laboratory studies may show evidence of massive hepatic necrosis with elevated aspartate transaminase (AST), alanine transaminase (ALT), bilirubin, and prolonged coagulation times (particularly, elevated prothrombin time). After acetaminophen overdose, when AST and ALT exceed 1000 IU/L, acetaminophen-induced hepatotoxicity can be diagnosed. However, the AST and ALT levels can exceed 10,000 IU/L. Generally the AST is somewhat higher than the ALT in acetaminophen-induced hepatotoxicity. The treatment for uncomplicated acetaminophen overdose, similar to any other overdose, is gastrointestinal decontamination. In addition, N-acetylcysteine (NAC) administration (either intravenous or oral) plays an important role. There is considerable room for physician judgment regarding gastrointestinal decontamination with gastric lavage and/or activated charcoal administration. Acetaminophen absorption from the gastrointestinal tract is complete within two hours under normal circumstances. This is somewhat slowed when it is ingested with food. Ipecac has no role in acetaminophen overdose because the vomiting it induces delays the effective administration of activated charcoal and (oral) NAC. Gastric lavage is helpful within the first two to four hours of acetaminophen ingestion. Activated charcoal is often more helpful than gastric lavage. Activated charcoal absorbs acetaminophen well and therefore reduces its gastrointestinal absorption. Administering activated charcoal also poses less risk of aspiration than gastric lavage. Previously there was reluctance to give activated charcoal in acetaminophen overdose, because of concern that it may also absorb NAC. Studies have shown that no more than 39 percent of oral NAC is absorbed when they are administered together. Other studies have shown that activated charcoal seems to be beneficial to the clinical outcome. There is uniform agreement on administering activated charcoal within the first four hours of acetaminophen overdose; administering activated charcoal after the first four hours is a clinical judgment and is considered a benign therapy. If concern exists that other drugs were ingested with the acetaminophen, then activated charcoal should be given. There are conflicting recommendations regarding whether to change the dosing of oral NAC after the administration of activated charcoal, and even whether the dosing of NAC needs to be altered at all. NAC presumably works by supplying sulfhydryl groups to react with the toxic metabolite so that it does not damage cells. If given within eight hours of ingestion, NAC reliably prevents toxicity. If NAC is started more than eight hours after acetaminophen ingestion, there is a sharp decline in its effectiveness because the cascade of toxic events in the liver has already begun, and the risk of acute hepatic necrosis and death increase dramatically. Oral NAC (available in the United States under the name "Mucomyst®") is a safe drug, is indicated in acetaminophen overdose during pregnancy, and life-threatening adverse reactions do not occur. The manufacturer's recommendation is avoidance of administration if an encephalopathy is present, due to the theoretical concerns that it may worsen encephalopathy. Intravenous NAC is commercially available outside the United States of America (under the name "Parvolex®"). In early 2004, the United States Food and Drug Administration approved a pyrogen-free NAC preparation (Acetadote) for continuous intravenous infusion over 20 hours (total dose 300 mg/kg) in patients presenting within ten hours after ingestion. This formulation has been used successfully for years in other countries, including Australia, Canada, and Great Britain. Recommended administration involves infusion of a 150 mg/kg loading dose over 15 minutes, followed by 50 mg/kg infusion over four hours; the last 100 mg/kg are infused over the remaining 16 hours of the protocol. The oral formulation can also be diluted and filter sterilized by a hospital pharmacist for IV use. It is a good option in patients who cannot tolerate enteral NAC or for whom enteral intake is contraindicated. Intravenous NAC is associated with allergic reactions such as anaphylaxis and bronchospasm. In clinical practice, if the patient presents more than eight hours after the acetaminophen overdose, then activated charcoal is probably not useful, and NAC should be started immediately. In earlier presentations the doctor can give charcoal as soon as the patient arrives, start giving NAC, and wait for the acetaminophen level from the laboratory. If the patient presents less than eight hours after acetaminophen overdose, the risk of serious hepatotoxicity has been rare. If repeat doses of charcoal are indicated because of another ingested drug, then subsequent doses of charcoal and NAC should be staggered every two hours. NAC is most effective if given early, but still has beneficial effects if given as late as 48 hours after acetaminophen ingestion. In general, oral NAC is given enterally as a 140 mg/kg loading dose followed by 70 mg/kg every four hours for 17 more doses. NAC can be difficult to administer because of its taste and its tendency to cause nausea and vomiting. To maximize tolerance, it can be diluted down to a 5 percent solution from its commercially available 10 percent or 20 percent solutions. Baseline laboratory studies should include bilirubin, AST, ALT, and prothrombin time (with INR). Studies should be repeated at least daily. Once it has been determined that a potentially toxic overdose has occurred, NAC must be continued for the entire 17-dose regimen, even after the paracetamol level becomes undetectable in the blood. If hepatic failure develops, NAC should be continued beyond the standard 17 doses until hepatic function improves or until the patient has a liver transplant. The mortality rate from acetaminophen overdose starts to climb two days after the ingestion, reaches a maximum on day four, and then gradually decreases. Patients with a poor course should be identified early and transferred to a center capable of liver transplantation. Acidemia is the most ominous indicator of probable mortality and the need for transplantation. A mortality rate of 95 percent without transplant was reported in patients who had a documented pH of less than 7.30. Other indicators of poor prognosis include renal insufficiency, grade three or worse hepatic encephalopathy, a markedly elevated prothrombin time, or a rise in prothrombin time from day three to day four. One study has shown that a factor V level less than 10 percent of normal indicated a poor prognosis (91 percent mortality), while a ratio of factor VIII to factor V of less than 30 indicated a good prognosis (100 percent survival). Boutaud, O., D. M. Aronoff, J. H. Richardson, L. J. Marnett, and J. A. Oates. 2002. Determinants of the cellular specificity of acetaminophen as an inhibitor of prostaglandin H2 synthases. Proceedings of the National Academy of Sciences 99(10): 7130–35. PMID 12011469. Full text. Retrieved February 11, 2016. Brodie, B. B., and J. Axelrod. 1948. J. Pharmacol. Exp. Ther. 94: 29–38. Crippin, J. S. 1993. Acetaminophen hepatotoxicity: potentiation by isoniazid. Am J Gastroenterol 88(4): 590–92. PMID 8470644. Nolan, C. M., R. E. Sandblom, K. E. Thummel, J. T. Slattery, and S. D. Nelson. 1994. Hepatotoxicity associated with acetaminophen usage in patients receiving multiple drug therapy for tuberculosis. Chest 105(2): 408–11. PMID 7508362. Swierkosz, T. A., L. Jordan, M. McBride, K. McGough, J. Devlin, and R. M. Botting. 2002. Actions of paracetamol on cyclooxygenases in tissue and cell homogenates of mouse and rabbit. Med Sci Monit 8(12): BR496–503. PMID 12503027. Zimmerman, H. J., and W. C. Maddrey. 1995. Acetaminophen (paracetamol) hepatotoxicity with regular intake of alcohol: analysis of instances of therapeutic misadventure. Hepatology 22(3): 767–73. PMID 7657281. This page was last modified on 11 February 2016, at 16:26.